It was the progressive Charles Davenport, founder of the Eugenic Record Office, who asserted around 1910 that the &#147;ability to be Americanized&#148; was a genetic trait. He led the scientific call for the sterilization of social defectives and the scientific breeding of racially superior Americans. A century later, the same exhortations to change American society are once again being foisted upon the American public by scientists, medical specialists, biotech firms, and corporate purveyors of every imaginable consumer product. As Americans are being persuaded that designer genes are merely the latest &#147;new and improved&#148; consumer choice, it is easily forgotten that today&#146;s &#147;genetic engineering&#148; is simply a repackaging of the old, allegedly discredited, pseudo-science of eugenics. 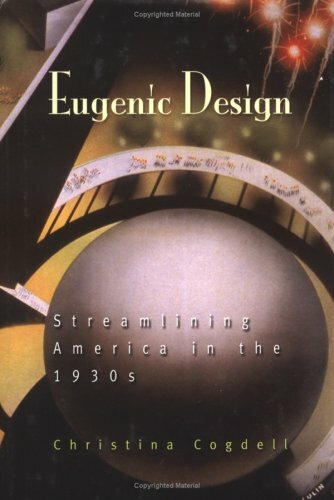 In her book-length study Eugenic Design, art historian Christina Cogdell sets herself the task of exploring the relationship between the aesthetic design of the 1930s known as &#147;streamlining&#148; and the legacy of early twentieth-century eugenics, by demonstrating how the same design principles underlie both. Just as breeding livestock may be viewed as a matter of applying &#147;streamlining&#148; to the field of animal husbandry, so, too, is it but an inconvenient ethical step further to breeding superior human stock. Her thesis turns on the cultural amnesia, the collective forgetting of just how powerful and influential eugenic thinking continued to be in the United States throughout the 1930s and beyond. Cogdell finds the principle of eugenics, or streamline designing of human beings, expressed in a parallel aesthetic sensibility, of incorporating design principles of aerodynamics, or more precisely, aesthetic interpretations of those principles into consumer design. Breakthroughs in the understanding of aerodynamics, applications to design, and the promise held out, as exemplified in Norman Bel Geddes&#146; iconic Futurama (the General Motors exhibit at the 1939 New York World&#146;s Fair), fueled the utopian vision of scientists, politicians, and corporate leaders alike. Corporate marketing departments wholeheartedly embraced the vision of a streamlined future, from household appliances and the houses containing them, to cars, highways, and automobilized cities, right up to and including streamlined people. In retrospect, people appear to become mere aesthetic effects to embellish a design model. Today this vision of commodified perfection (including humans as perfectible consumables) saturates and compels the popular imagination more than ever and propagates itself worldwide powered by corporate global expansion. Cogdell&#146;s argument seeks to establish a direct, explicit relationship between the two: eugenics opens the door to the thinking which transforms human beings into commodity objects. And this, in turn, according to Cogdell, is the trap door on the slippery slope of the still unresolved ethical issues concerning engineering human beings. While contemporary America is being encouraged to believe genetic engineering is simply taking cosmetic surgery (from a face lift or orthodontic braces to liposuction and organ transplants) one logical, consumer-choice step further (preselecting the eye color or the gender of a test tube baby-to-be or gene splicing away genetic &#147;diseases&#148; and preselecting raw genetic material to improve &#148;desirable&#148; characteristics, such as intelligence, beauty, heterosexuality, or the ability to &#147;get along with others&#148;), Cogdell begs to differ.